Polar bears are technically the largest land carnivore on earth. But they’re also marine mammals. And in the last couple of decades the Arctic sea ice has begun to vanish out from under them. So they are spending more time on land. Nowhere is this more visible than in the tiny Alaska Native village of Kaktovik, on the coast of the Beaufort Sea. And while we hear a lot of alarm about how vulnerable polar bears are to climate change, in Kaktovik, changing ice conditions have created something different: too many bears. There have always been polar bears around Kaktovik. But they used to be out on the sea ice, hunting their prey of choice: ringed seals. In the mid-1990s, that started to change. Locals started noticing more bears on shore. And researchers noticed that female bears were making dens more in the snow on land rather than out on the ice. “The Fish and Wildlife Service biologist started hearing about increasing numbers of polar bears on land from residents as early as the early 2000s,” Jennifer Reed said. Reed works for the Arctic National Wildlife Refuge, which surrounds Kaktovik. When they started seeing more bears on land — and in town — than ever before, the community asked for help. So, Reed and other federal wildlife managers came in and started teaching people bear safety — like what to do if a bear came into the village, and how to get it to leave without hurting it. And then in 2008, Secretary of the Interior Dirk Kempthorne announced that polar bears were threatened in the United States. Not because their numbers were declining, but precisely for the reason they were coming ashore in Kaktovik: their world was changing and fast. Suddenly the whole world was aware of the polar bears’ plight. 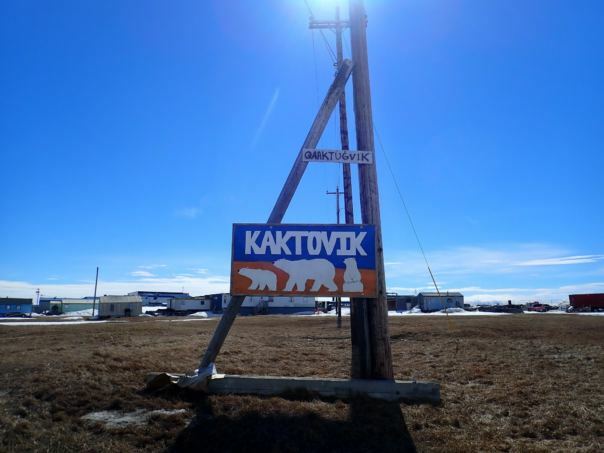 And that’s when outsiders started showing up in Kaktovik: tourists, who wanted to see polar bears before they went extinct. More than 2,000 people came to Kaktovik last year to see polar bears. That’s a major tourism boom for a town this size in a place this remote. Most of the tourists come in the fall, for a number of reasons. That’s when the sea ice is the farthest away from the shore, forcing the bears toward land. Also that’s when the people of Kaktovik harvest three bowhead whales. At the edge of town, there’s a huge pile of bones, where the community has been taking their whale remains for decades. It’s not safe to walk to the edge of town alone any time of year, so I hitch a ride with Bruce Inglangasak, an Inupiaq subsistence hunter who offers wildlife viewing tours, including polar bear tours in the fall. Inglangasak says he’s seen a lot of changes since he moved to Kaktovik — bigger storms, less sea ice, more polar bears. The bone pile is at the end of the old airstrip, a narrow strip of land with the frozen Beaufort Sea on both sides. Even in summer, the road is covered in so much snow, we can’t get any closer than maybe a half mile. There aren’t any bears at the bone pile today, but Inglangasak says he sees bears year round. 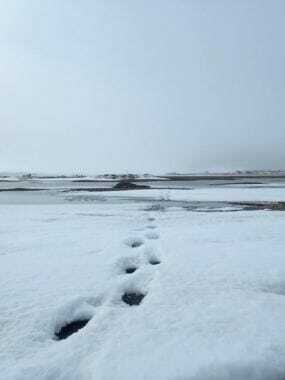 As summer progresses and turns to fall, the ice will be gone and some bears will be stranded near Kaktovik until the sea freezes again in October or November. Those stranded bears are a guarantee for tourists. But not everyone is on board with the attraction. When Inglangasak became a licensed guide, he says 90% of the town was against commercial tourism. The tourists haven’t stopped whaling, but there are still people in Kaktovik who feel like visitors gawk at their subsistence activities. It’s an invasion of privacy. 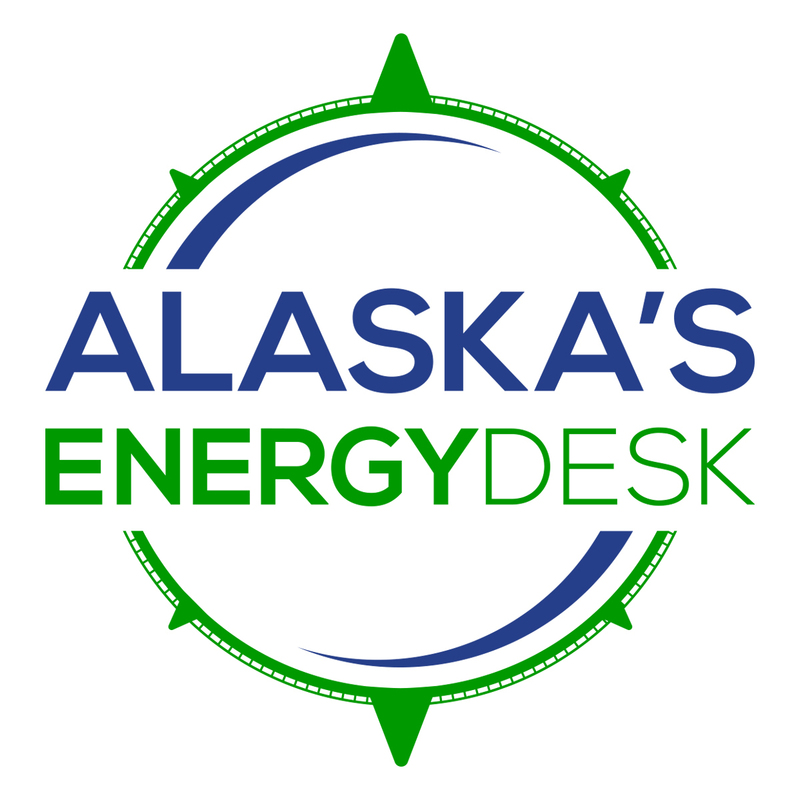 Also, late last year Congress opened up part of the Arctic Refuge to allow oil exploration and development on the coastal plain where Kaktovik is located. So, the town is preparing for a potential oil boom. It could be a game-changer for the whole region. And for some people, that makes polar bear tourism — and the money it brings in — seem like a drop in the bucket compared to the potential of oil. But that’s months or years away. And right now, there’s plane load after plane load of tourists eager to see Alaska’s most iconic endangered species.